Over the years our company has conquered new markets in Italy and abroad as a result of our expertise in progressively broadening the range of products and materials we offer. Today our company is recognized as one of the most specialized firms in the production of items that involve the use of marble, granite and natural stones. 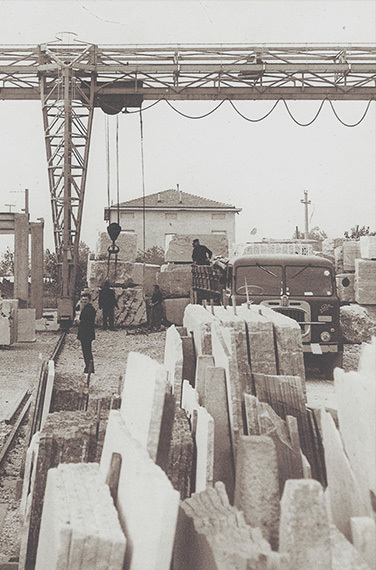 The marble and granite blocks are directly procured from all over Italy and from many other countries including Norway, Finland, Brazil, South Africa and India. Our materials, all of premium quality, are always readily available and continually renewed to ensure a wide application of these for our clients. Considerably big projects require a significant amount of slabs that suggest a continuity of chromatic solutions and well defined technical characteristics. Additionally, the different variety of materials readily available allows us to easily combine and select diverse products according to their use. The slabs, obtained through a cutting process, are later polished, honed, brushed, sanded, antiqued, flamed or differently handled according to its application and purpose.